Alec Belanger’s first OHL goal stood as the winner as the Ottawa 67’s closed out a 2-0 weekend with a 5-3 win over the Hamilton Bulldogs on Saturday. After Kody Clark opened the scoring for the home team in this one, the Bulldogs scored three goals to take a 3-1 win in the second period. That didn’t last long as Marco Rossi scored twice, giving the rookie three goals in two games this weekend, to pull his team even. 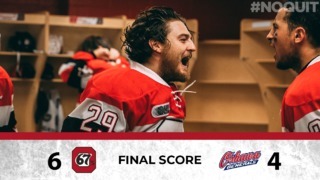 Less than a minute later, Belanger gave the 67’s a lead they would not give up. Tye Felhaber would add his league-leading 48th goal of the year to provide some insurance. Mikey DiPietro, who set an OHL record with his 17th shutout on Friday night, stopped 24 Hamilton shots to pick up the win in goal. 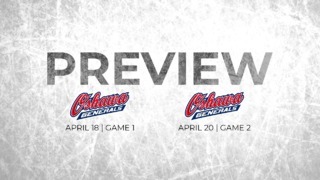 The 67’s return to action next week when they visit the Oshawa Generals on Friday night before hosting them at The Arena at TD Place on Saturday, January 26th, at 3:30 p.m.
– 67’s defenceman Hudson Wilson had a game-high four shots on goal. 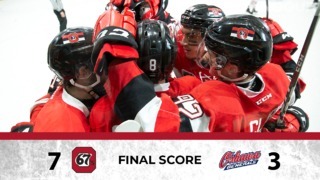 – The 67’s outshot the Bulldogs 31-27 on Saturday afternoon. – Marco Rossi (two goals), Tye Felhaber (one goal, one assist) and Sasha Chmelevski (two assists) all had multi-point games on Saturday. – The 67’s were successful on their only powerplay opportunity of the afternoon, with Rossi’s first second-period goal coming with the man-advantage. – Chmelevski was an impressive 11-for-13 in the face-off circle against the Bulldogs. The 67’s had a 33-25 overall edge in face-offs.